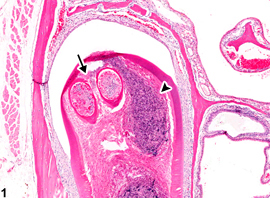 Tooth - Necrosis in a male B6C3F1 mouse from a chronic study. There is necrosis of most components of the tooth, including the 2 denticles in the pulp (arrow), and suppurative inflammation of the tooth pulp (arrowhead). Tooth - Necrosis in a male B6C3F1 mouse from a chronic study (higher magnification of Figure 1). 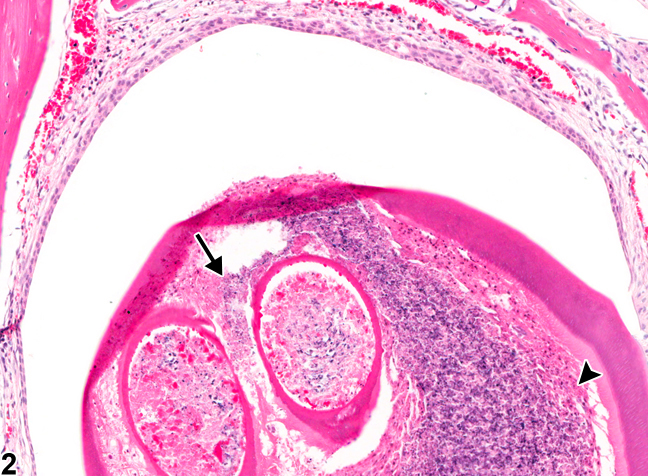 There is necrosis of all components of the tooth, including the 2 denticles in the pulp (arrow), and suppurative inflammation of the tooth pulp (arrowhead).